The latest film from Japanese commercial helmer Isao Yukisada has some creative bright spots, but it’s overlong and features twists that come too far out of left field. Nowadays most children's films (especially fantasies) are based on previously published material, so it's nice to see a director like Isao Yukisada make a film like Into the Faraway Sky. Yukisada created the film from scratch, developing it over a period of seven years. Though it's marketed as a children's fantasy, Into the Faraway Sky isn't exactly a fantasy. It's really about three children in a small town and their friendship. But it isn't really for children either, as children wouldn't have the patience for a 145-minute film about conservation that features Eastern European influences. Nevertheless, the resulting product does have several bright spots, and parents are likely to have a better time than their children. 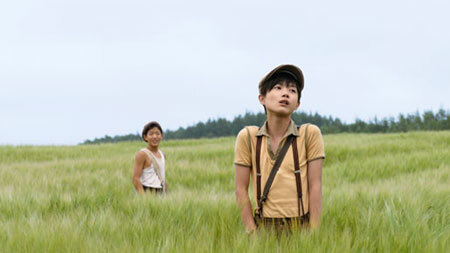 Mostly told in flashbacks, the film follows Ryusuke (Ryunosuke Kamiki), a young boy who has moved into an unnamed small town (the film was shot on the northern Japanese island of Hokkaido) with his no-nonsense father. However, he becomes unpopular with his new schoolmates when it comes out that his father is there to replace the town with an airport. Nevertheless, Ryusuke strikes up a friendship with classmate Kohei (Yuma Sasano) and Hiharu (Suzuka Ooko), a girl who often stands on top of a hill to ask for UFOs to kidnap her. Meanwhile, the adults of the town are concerned with stopping the airport effort, but only by talking and building a barricade manned by local thugs/bullies who do little in the way of a real solution. There's also the kids' teacher Sawako (Ayumi Ito), who starts a romance of sorts with a mysterious flying man played by Chang Chen. Yes, Taiwanese actor Chang Chen continues his conquest of major Asian cinemas with a strange cameo in his first Japanese film (he also spoke Japanese in The Go Master). In addition to that bit of Pan-Asian crossover, the film's fictional town features signs in Russian, as well as a strange love for Eastern European folk music. Yukisada creates a nation-less land with eccentric characters that can only come from the imagination, and despite his reliance on sometimes-borderline adult humor (kids will likely be asking why some women lift their skirts as a way of greeting), the film works for the first 90 minutes. There may not be much going on in terms of fantasy, but the film has a lighthearted spirit that keeps it entertaining, with its favorite comedy prop being piles and piles of cow poop. However, after that 90-minute mark, melodrama again rears its ugly head. You can almost hear the exact moment when everything goes wrong, as the events leading up to the finale become too dramatic to fit the tone of a children's film. By fitting in these events, Into the Faraway Sky is stretched out to an epic 145 minutes, making it Yukisada's 4th consecutive film to run over 135 minutes (his latest, Closed Note, also runs 138 minutes, making that streak now five films long). While length does not automatically determine a film's quality, the issue here is whether a pseudo-children's fantasy film targeted at family audiences needs to run this long, especially when that length is created by inserting plot twists that clash with the overall established tone of the film. You know a film is in trouble when the audience starts missing gags with exploding cow poop. Nevertheless, Yukisada continues to prove that he's one of Japan's strongest commercial directors; the film features the helmer's usual fluid cinematography (this time by Jun Fukumoto), toning down the Shunji Iwai-influenced bleached-out handheld cinematography that he liberally borrowed for Crying Out Love, in the Center of the World. He also gets believable performances out of his young cast, with Sasano delivering the best performance as the silly Kohei. On the other hand, while Kamiki will probably grow into a handsome star, he demonstrates a lack of acting chops here, as he struggles in some of the film's more dramatic scenes.